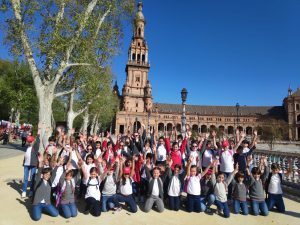 As part of the Geography Topic “Contrasting Localities: Gibraltar and Seville”, the Year 5 pupils went on a field trip to Seville to visit some of the most famous buildings in the city. Their first stop was at La Plaza de Espana where pupils admired the building and then spent some time walking past all the alcoves, searching for provinces they recognised. From here they moved to the Cathedral, where they learned about the outside construction and history of the weather vane. Once inside, the pupils saw the wonderful courtyard, the magnificent stained glass windows, Columbus’s tomb and the stunning Altar Mayor which shows different moments in Christ’s life. Then it was off to climb all 34 ramps up to the top of La Giralda where they looked out at the amazing views of the city from the bell tower. Lunch followed at a small park and then the sightseeing continued in El Alcazar, the Royal Palace. Pupils wandered through the beautiful gardens taking in the statue of Mercury in the large pool. They saw the underground bath with the incredible vaulted ceiling and visited El Salon de los Embajadores with its domed ceiling and spectacular patio. A short stop back at La Plaza de Espana was made to give the children a chance to purchase a small souvenir of their visit to Seville and then they began their return trip to Gibraltar. A full day which the pupils will remember fondly.